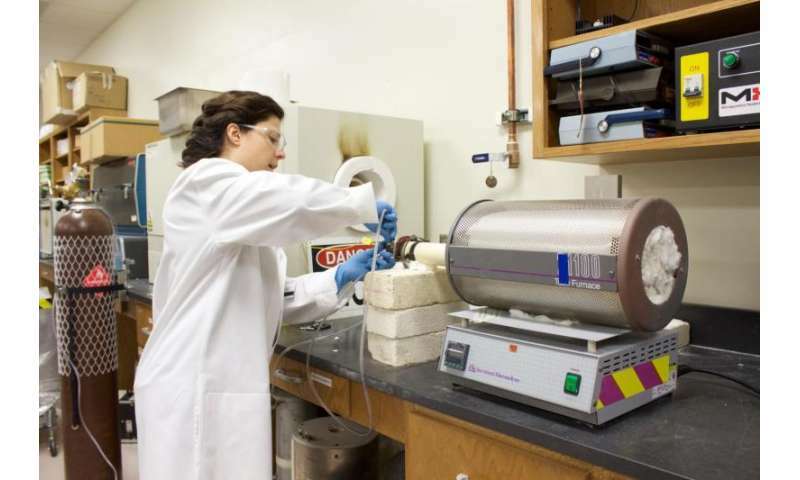 Researchers with the Fuel Cycles and Materials Laboratory within the Department of Nuclear Engineering at Texas A&M University are working to make big impacts on energy efficiency with small materials level changes. The group is creating porous fuel pellets for use in reactors, as opposed to the currently used solid pellets, to extend fuel life, possibly reduce waste and increase the amount of energy the reactor can get out of the fuel. Graduate student researcher Yesenia Salazar works under the group's principal investigator Dr. Sean McDeavitt, associate professor of nuclear engineering and director of the Texas A&M Engineering Experiment Station's Nuclear Science Center. Salazar's job is to work with copper powder and produce the fuel pellets and test them under various pressures and scenarios to see how they perform in reactor-like conditions. Salazar works specifically with copper because its properties can be translated into digital code more easily, which is an important aspect for the computational side of this project involving modeling the behavior of the fuel pellets. 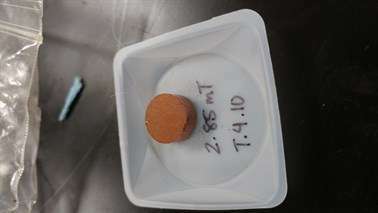 "Our overall goal is that when we make this pellet, we take measurements for the porosity that it has," Salazar said. "We're trying to be able to have pores that are more or less homogeneous, where they are not just in one section of the pellet. If we can get more or less homogenous pores, we test them at these different pressure and temperature levels to see how they would perform inside a reactor setting." The pores in these fuel pellets are meant to help counteract a phenomenon that occurs during nuclear power generation, where, after a short time, the pellets begin to swell because of the gases and fission products that are expelled during the energy generation process. This expansion, if continued beyond a certain point, becomes dangerous not only in the process of producing energy, but also when the fuel source eventually has to be removed. Delaying the expansion of these pellets is where the pores come in. "We believe that if you have even just a little bit of porosity introduced into these pellets, those gases that are coming out and that swelling is happening will accumulate to make up for the space in those pores," Salazar said. "It works very similar to the way a kitchen sponge works, soaking up all the water it can before its pores are full, at which point it expels the water. We want to delay the expulsion as long as we can." Salazar they would like to see an increase of at least 5 percent in comparison with the lifetime of current fuel cells. It is not known how long it will take for the expansion of the gases and fission materials to fill up the space in those pores before they start expanding, which could differ depending on the type of reactor and fuel source used. While the full potential is yet to be determined, the guiding principle is getting the most usage possible out of the fuel while it is in the reactor. "Regardless, when we do take the fuel out it will be more dangerous than it was when we put it in," Salazar said. "We want to be able to use this research to leave that fuel in longer, which will increase the efficiency and allow us to delay taking out this material because we are getting more out of it per ton." According to Salazar, the average lifespan of a nuclear fuel cycle can last anywhere from 16 to 36 months, and researchers are hoping that the pellets may extend the process at least an additional week or more. This increase may seem nominal in relation, but it translates into significant energy production per ton of fuel. Inside nuclear reactors are several hundred fuel pellets in dimensions of centimeters, which have the rough energy equivalent of a barrel full of oil. According to the U.S. Energy Information Administration (EIA), even the R.E. Ginna Nuclear Power Plant in New York, the smallest nuclear plant in the United States, can generate 508 megawatts of power an hour. With an extra week of power this becomes 85,344 megawatts per week if the plant is operating full time at maximum capacity, which based on public information from the EIA, has the potential to power 7,983 homes per year on average. "The potential of nuclear power is truly humongous," Salazar said. "This research is really great so far and can have even greater results years from now, but I feel like those results can only be empowered if the general public's view is more accepting of the benefits of nuclear energy."